Chesapeake Choral Arts Society, Inc. 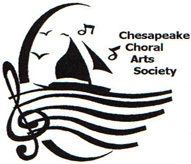 The mission of the Chesapeake Choral Arts Society is to bring excellent choral music to a variety of audiences of all ages in Southern Maryland though concerts, collaborations with other music groups, and performances for community organizations. By focusing on musical masterworks from the past to the present, audiences and performers will expand their knowledge of and appreciation for the choral music art form. We are a community chorus for all ages (high school through whatever!). We do three concerts a year - December, March (Pops concert) and June. Auditions are held in September and January, with special auditions as requested. Watch our website for concert dates and locations. A small group of CCAS members perform at the 'Pageant of Peace' National Tree Lighting Ceremony in Washington, D.C.